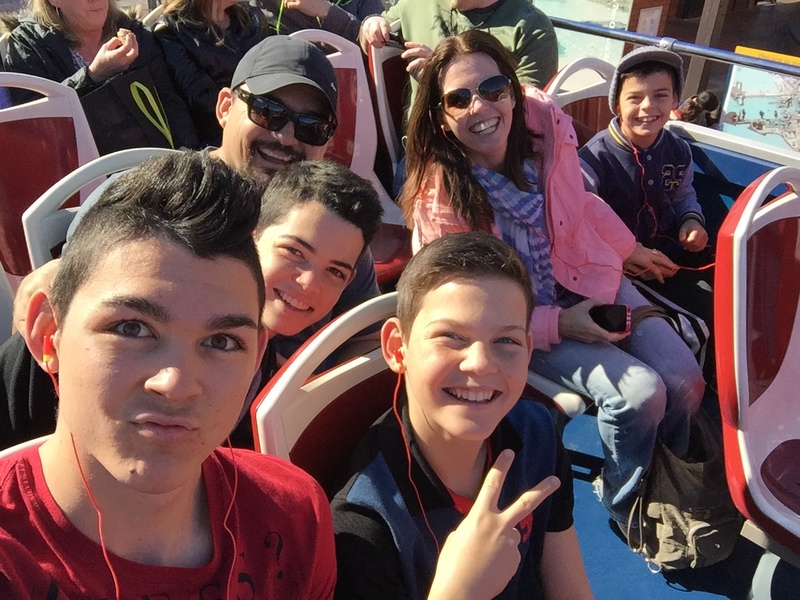 On the top of the double decker red bus tour of Cape Town, one of the touristy things we did during the July holidays. Family life. I think we’re striking the balance. Some days, anyway; maybe even most days. It’s like standing on a see-saw, you know. If you walk on the bar a little too much to one side, the whole thing tips up, and it’s scary, and dangerous, and you have to find the point of balance again before you fall and break your head. What are you doing walking on a see-saw anyway, that’s the real question, and does your mother know you’re doing that? Sometimes I think my see-saw totally falls off its pivot thingy. It reminds me of a funny conversation that Heath had with one of the Xhosa guys he works with…this guy knows God and has completely changed his life, his culture, because he just believes God, and knows he’s loved. Oh, I love those basics, they’re revolutionary. Anyway, they discuss various issues together…serious and not so serious. One day he comes into work and says to Heath, hey Meneer, what is the story with the women? Eish. One minute- my wife, she’s happy, then sad, then happy, then sad. I don’t understand it. It’s like the Cape Town weather. Hot, then cold, then hot… when he sees Heath laughing, he realises, (cue song) You Are Not Alone…. printed out all the scriptures pertaining to sleep, which, when you read them, will make you want to go to bed right now, and that helped. (I’ve posted them here in case anyone in your family starts to be awake when they’re asleep.) One night we took Ethan into our bed to comfort him, and so we could all try and get some sleep. To have enough room, I spoon with Heath, who twitches when he falls asleep, resulting in kung-fu chops to my spine, if I’m not careful. Ethan’s elbow is in my ear, and I am lying there thinking about how we’re in the last week of the holidays, I haven’t done enough maths practice with the kids, Ethan’s confusing pronouns and proper nouns and I should be reading daily with him to help him, Joshua’s cough has lasted 4 weeks now and needs more attention from me… and I feel so overwhelmed and inadequate as a mother, like I’m only able to input, say, 60% (on a good day) of what each child really requires to be…well, perfect, and whole, and complete. And there’s never any time (or space in the bed) for ME. These times always bring me to a point of realising it’s not about me being able to DO everything, but it’s about me trusting God to do everything that I can’t; it’s humbling, and it’s good. Back to the sleepwalker. I sensed a few days later that it was more an issue of fourth-born teasing. Three older brothers who love to laugh. I mean, Ethan’s nicknames are Pip (short for Pipsqueak), Squire (olde English, as in servant), and Blazer (because he’s blazing…not understanding the jokes, or missing the point, etc). We’ve spoken to the boys about the effect we think it’s having on Ethan, so they’ve stopped, and are trying to build up more rather than tease and laugh at him, and, after about a total of 10 days, he’s stopped sleepwalking. So excuuuuuse me if we’re a little like the Cape Town weather; or a very dodgy see-saw. I saw this the other day, and thought how true it is in my life. Like when we were clearing up plates after dinner and Ethan tells me the story about how a girl in his class sneezed in front of him. And guess what happened Mom? (Confirm your mind doesn’t know quite where to go now, right?!) A bogey, Mom! It came right out of her nose and landed ON THE DESK in front of me. But she didn’t see it!! I couldn’t believe it! I wish you could see his face. His eyebrows are as high as they can go, and he’s nodding so that you know that this really true. By this time I’m doubled over laughing, not so much at the bogey- forgive me, stories like this don’t faze me anymore- but more at my precious child who has to deal with things like this on his own in the big wide world. I manage to get the question out, So what did you DO? Well, nothing. I just said, bless you. Aahh, and there is the proof of a gentleman. Rule #4931 in the Gentleman’s Handbook: don’t point out stray bogeys; this will cause embarrassment to the bogey launcher. Cover the offence. Be a man. Oh, I haven’t laughed like that in ages. A perfect moment. Ethan’s actual bed hair one day. 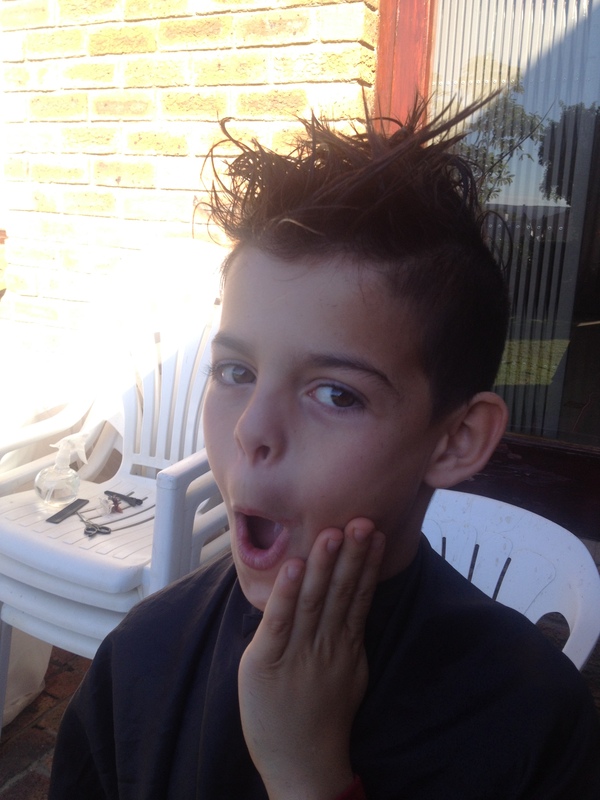 The resultant haircut- this is the before pic. And then Luke. He decided to grow up. Pretty much overnight. His report from school at the end of term was a little scary, so he decided. It always needs a period after that sentence when it pertains to Luke because when he decides, everything else stops. Like when he decided he wanted to participate in cross country at his old school in Zim, and we said he could- only if he got his grades up. So he scored only A’s and B’s, and then won the cross country. So he’s gone back to school this term determined to do well, and is causing his teacher to send me emails asking what has happened. He is finishing all his work, has not had any homework for dayyyyys…please, dear reader, understand- DAYS I tell you; and he continues to be kind, compassionate and helpful to all. Even the Afrikaans teacher (a guy) put his hand around Luke’s shoulders this week and said, Aweh, bru. This is no small thing. This Afrikaans teacher, to quote Luke, “never says Aweh and never says bru, and he said them BOTH…to ME…at the same time (he shrieks a little through his grin)… it was so JUS!” (Aweh=South african slang, used to acknowledge something or greet someone; Bru= my bro, buddy, pal, my china. Jus- cool, awesome, fantastic. Spelling? Maybe it’s jaas. Who knows, it’s a made up word, for goodness’ sake.) He has really noticeably matured. One day he said to Heath, “Daddy, do you know what I wish? I wish that everyone could be happy with themselves. Even though they’re as tired as a mom.” A perfect moment. 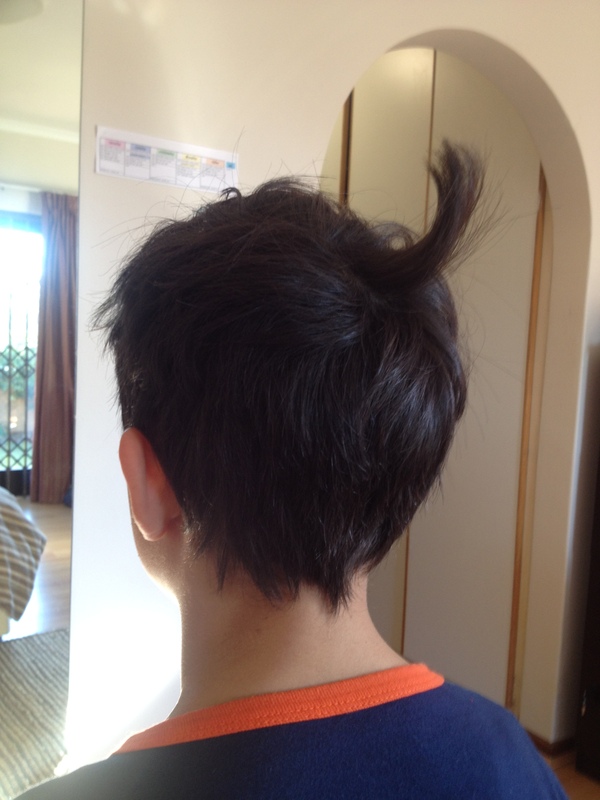 And then he grew a winky hair. Which he will gladly show anyone who is walking past the bathroom door when he is bathing, by pulling the hair (the One and Only) out so that you can see the skin pull up. He is so excited. He has been looking out for pit hairs for months already, claiming they’re growing, but then they always turn out to be dirt or lint. So when this was confirmed it was, well, JUS. He’s very proud. Sorry, bogeys and winky hairs, I’m just not fazed anymore. I suppose it’s the perfect moments that keep you from falling off your perch completely. They demarcate a place of arrival, of growth, that you’re better than where you were yesterday. They celebrate it. They bring everything into focus…they make what’s important important, and what’s not important, not important. Sanity preservers. They bring the see-saw into perfect balance. Hooray for perfect moments. commentary. Cause of vomiting still unexplained. In addition, Ethan had been sleepwalking, and my incredible ability to procrastinate doing a birthday gift meant I was up late painting pebbles the day before they were due. Stupidy stupidy stupidy) I decided to risk wearing my pyjamas on the school run. It shouldn’t be much of an issue in Cape Town, right, since many people wear their slippers or no shoes at all to the mall? Well…I nearly had an accident on the road 9 times. It just seemed to me that somehow, all of the Northern suburbs was going to see me stranded on the side of the road in my lilac winter pyjamas, my fleecy, delicious grey dressing gown and my slipper boots with the fur. Yes, I bought them so I could sing that line from the song, boots with the fur. So I have never worn my pj’s on the school run again, it’s too terrifying. I put on my applebottom jeans instead. Ethan’s Grade 4 school camp, his first ever and he is beyond excited. Then we get The Call. Ethan has hurt his leg whilst building a human pyramid during one of the activities. Someone big landed on it. Heath got the call from his teacher, thankfully- not me, as I may have cried out loud. He spoke to Ethan and asked if he wanted to come home, but he said he would brave it out and hang in there, which he did. He had a great time in the end, and on the trip home was telling us all the camp stories. One of which ended with us all choking back our tears. 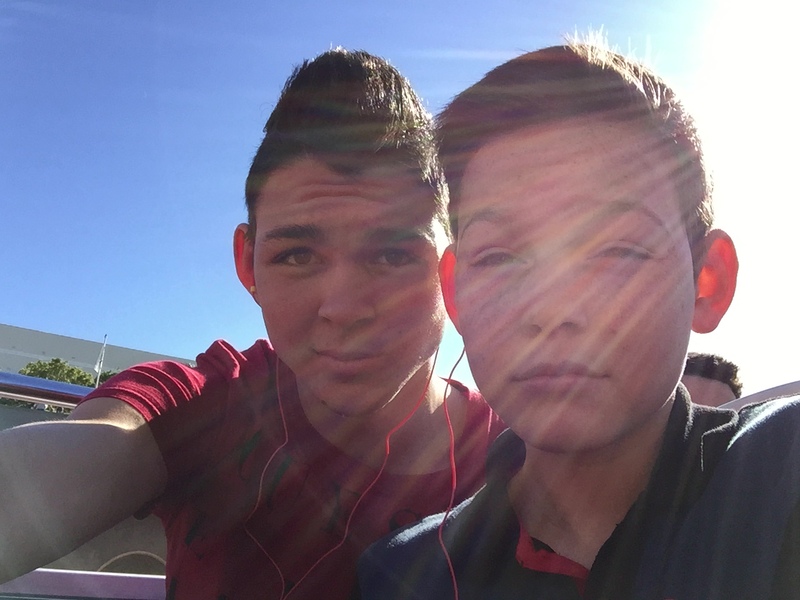 His best friend had been sad on camp because his mom and dad were getting a divorce, and in a few weeks time, his mom would be moving out. Ethan said his friend had cried a bit, then he had cried a bit (then we all cried a bit), then Ethan prayed for him. That’s what it’s all about, our days down here, right? Touching those we see and know every day, even if it’s in a tiny way to let them know they are loved, and thought of, and seen. 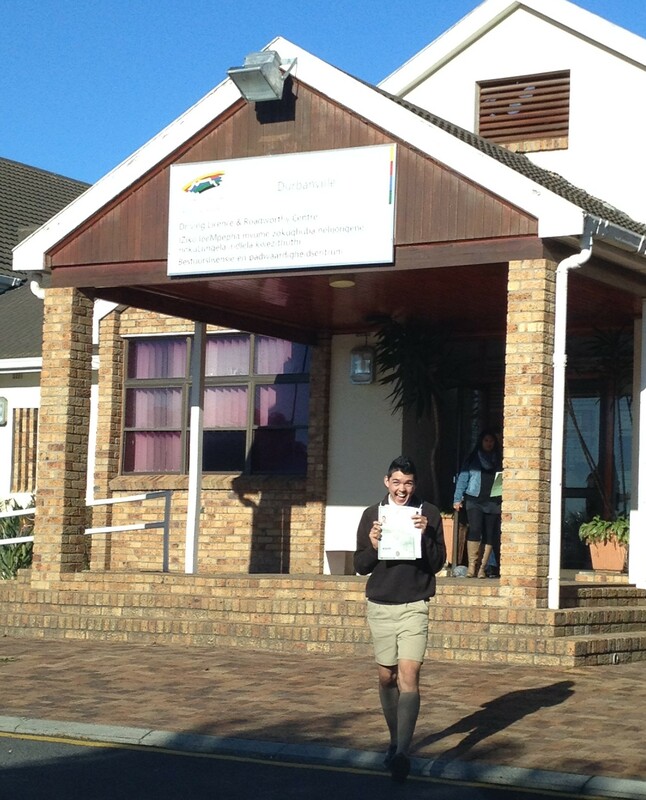 6th August- Joshua passed his learner’s license, meaning he can begin to learn to drive. A car. You may pause reading and quickly jot down your fasting and praying schedule from here on. He hasn’t done any driving up to now, as we’re trying to avoid my being deported, so we’re not doing anything that even smells illegal. Well, that wouldn’t really apply in my household, but now I’m off topic. So Heath takes him for the first lesson. Yes, the handbrake was used. By Heath. But there was no screaming or crying, or shattered glass. So it was a good lesson. Joshua said to me yesterday that he doesn’t know why he’s so afraid when he’s learning. I said, good. Be afraid, be very afraid and stay afraid. Okay, then I said it would be better as time goes on, but I have downloaded all the youtube videos on distracted drivers, texting drivers, un-seatbelted drivers, which will all be played repeatedly for him. Did a little dance in the parking lot as he came out. 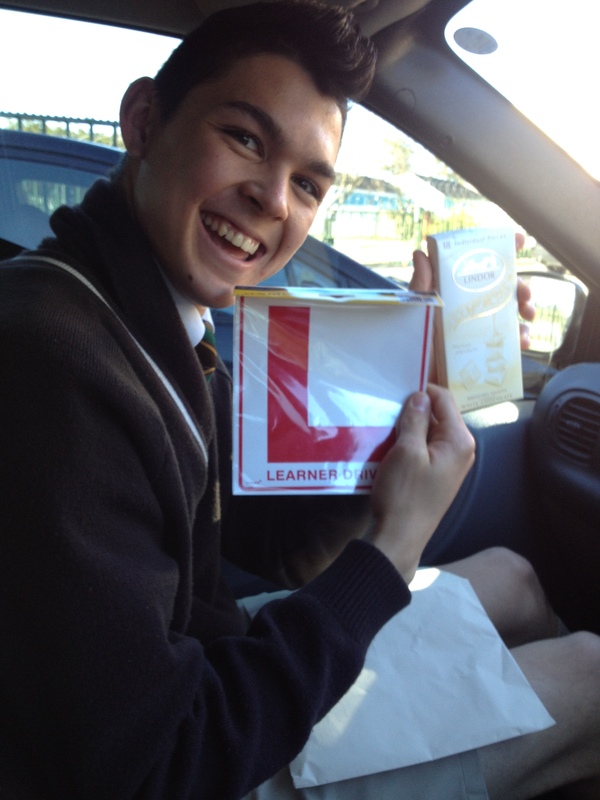 L plates and a slab of white chocolate to celebrate. Who could ask for more? On advice from my brother Brendan, who has dealt with more immigration issues than should be mentioned, Heath and I decided to go big guns lawyer to sort out my immigration status. A quick update- using the standard procedures, my visa application has been denied twice, as the law changed shortly after we had arrived in SA, in that you now have to go back to country of origin to change your visa status. This is very unrealistic for us, as it entails a minimum 6 month stay in Zim for that to be sorted out! So we emailed an immigration lawyer who responded saying he really like our case, it was clean, very strong, and he would take it on. So we prepared to meet with the junior advocate (don’t be misled by junior- there is nothing junior about his hourly rate, but we get it all back when we win). A trip into Cape Town city centre is always a logistical challenge with Heath having to get off work, then leaving early to avoid traffic. We left at 6am for a 9am meeting, because if you leave at 7, you’ll sit in traffic for 2 hours. We decided we could grab coffee and make a romantic, one-on-one date of it once we got through to town. Well, turns out everyone else has the same idea. The 6am guys are all avoiding the 7am guys, and so on. Anyway, it took us about 45 minutes, and we chose one of several dodgy coffee shops to stop in. The dodgy coffee shop’s menu. 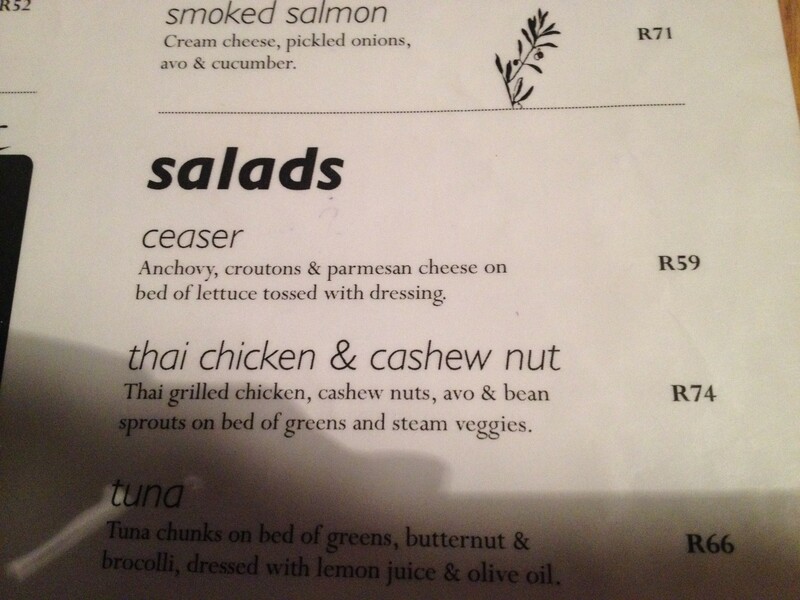 We thought it better not to order a Ceaser salad, in case we ceased to be. The dodgy coffee shop’s toilet key. 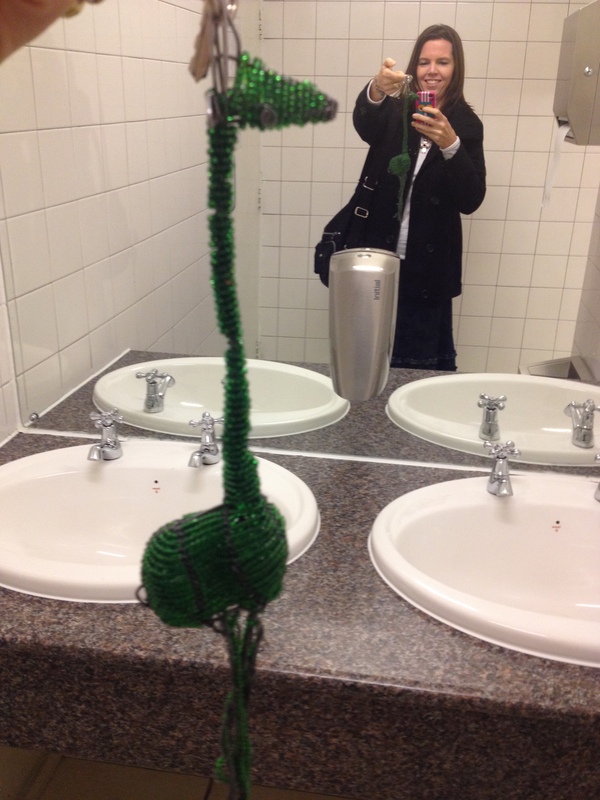 Clearly theft of keys a problem before enormous giraffe installed as keyring. 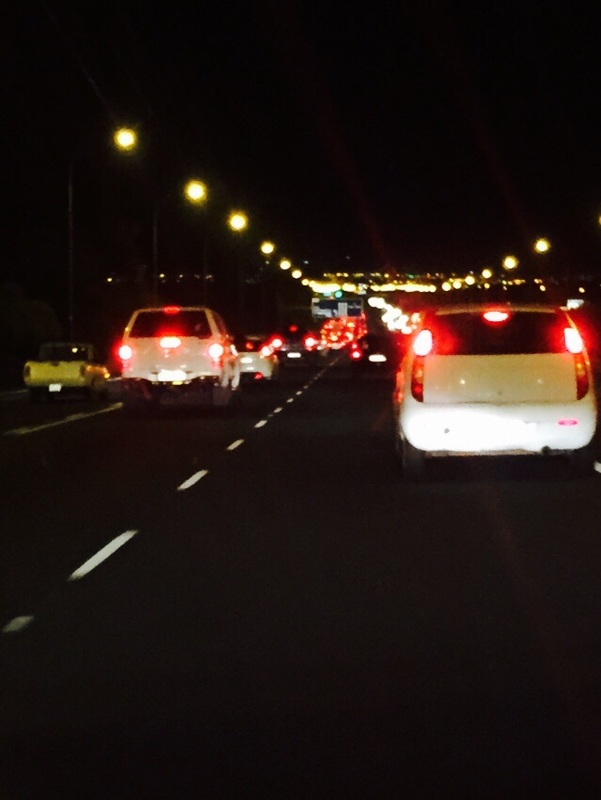 The traffic on the N1 into CT at 6am. How romantic. The meeting went well, they are very optimistic about the outcome of our case. Since then, we have had an article in the newspaper, as advised by our lawyer and have filed our case with the High Court. We had to sign the papers, which were then co-signed by a Commissioner of Oaths. I find that when the situation I am in is heavy and serious as this was, I default to silly. When the important dude was co-signing the papers, he looked at me and said, raise your right hand and say, So help me God. I thought he was joking, so I smiled and did it, expecting him to respond with, Woo hoo! High five, girl! Now let’s get this done! But he didn’t, he turned to Heath and told him to raise his right hand and say, So help me God, which he did, serious faced. The fact is, for many weeks leading up to this moment, we have been saying daily, So help us, God. Anyway, I contained myself, the papers were lodged at the High Court and now lawyers and Home Affairs are sending papers back and forth, and we await a confirmed court date any day now. Adding to your prayer schedule… thank you. Ethan turned 10 in June. It was the first milestone where we could really reflect back on last year, when we had just arrived. 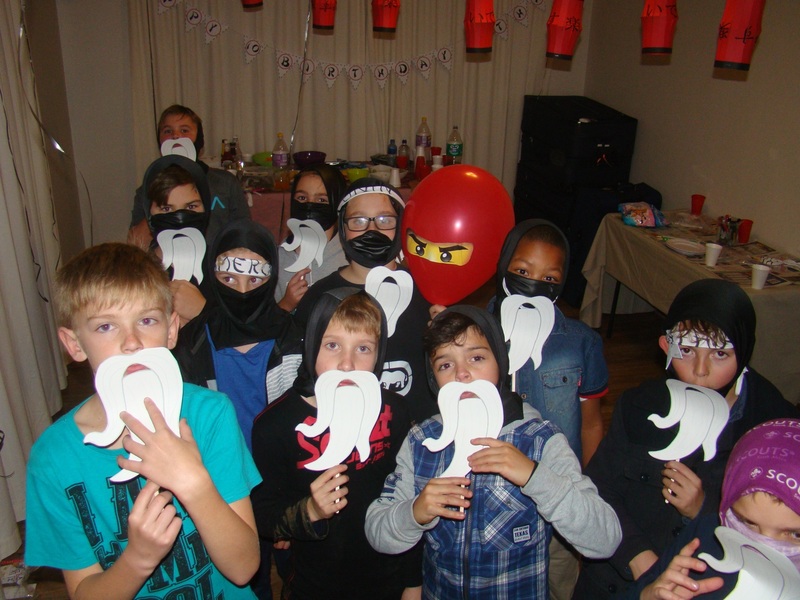 So we decided to go all out and have a party at our home with 10 of his friends, ninja themed, cake, balloons and all. On the Friday of the party, I organised helium balloons, and had them with me in the car on the school run. I decided that if ever I am feeling low, I will do this again. Helium balloons are now my happy place. At 5pm, everyone begins to arrive, on time. (This is a novelty for us, we’re used to Zimbabwean time, where people still arrive for leftovers on the following day.) A few parents did come in and suss us out to ensure their children weren’t about to be shipped off to Russia, as we hadn’t met most of them before. I should have begun to feel uneasy when one of the moms, after meeting us, made a rather too hasty dash for her car, calling out over her shoulder, Good luck! Then another dad brought in a child with nunchucks. Yes, the invite did say ninja theme, but didn’t say, hey, bring along your weapons of destruction! They were real ones and weighed a ton. Then the dad left, and the nunchucks stayed. With ten 10 year olds. In my house with windows. All boys, they ignored the tantalizing chill-out room, where they were supposed to could listen to music, chat to their friends, and nibble on the snacks; they decided instead to go outside, play soccer in our 12x10m yard and dive with their whole bodies into the mud, and then play hide and seek, even though we only have 2 shrubs and 1 tree that can hide a very skinny child. Other than that, I think we kept pretty good control. We roasted marshmallows around the braai without anyone going up in flames, the games and treasure hunt were a great success and I even bribed them to eat proper food before getting sugar loaded. Heath, in his wisdom, decided to get a DVD for them, which they watched at the end. Then at 8pm, a huge flying saucer arrived over our house and sent down its powerful tractor beam, sucking up all invitees. Well, that may as well have happened…it was that sudden. One announcement of, There’s a car outside! and then all children were reclaimed- complete with muddy shoes and nunchucks- by punctual parents, who disappeared into the night, grateful for their 3 hour reprieve. Heath, Joshua and I all collapsed on the couch, stunned by the tornado that had just swept through the house, and pledged to one another that in the future, if anyone is thinking about having a party at home, they are to be reminded with one word: nunchucks. Outsourcing from now on! As is the custom here, Ethan received cash as gifts (much to my horror- I am a pedantic, thoughtful, over-sensitive gift-giver) and decided to buy a new tablet, which has proved to be a real blessing. World movie together, relaxed, went to church on Sunday, lunch out with friends, and a sleep in on Monday morning, as that school term can begin to feel like you’ve done a tour of duty. However, by Wednesday, I realise that the real tour of duty is at home now. The natives are constantly hungry, aggressive and restless, requiring endless attention and input. It is exhausting. I go grocery shopping to get away from it all, which is probably as desperate as it sounds. One day I was in the little Greek deli down the road, trying to get goat’s feta for a quiche; goat’s feta so much healthier, so I was looking for it, but couldn’t find it. I found one of the managers and asked him if they had it. THIS IS WHAT HE SAID. No, there’s nothing. Still mating. This was one of those moments where your mind travels light years and back in a nano-second, computing the last input. The goats. They’re still mating, so they don’t make cheese. (They make kids instead of cheese, clearly.) Goat Wikipedia in the Deli Manager, who would’ve thought? I managed to respond with, ‘Oh…okay. Thank you’ before I left. It was definitely more info than I had bargained for on an innocent search for cheese. We mostly just relaxed at home during the holidays, and I DO remember one day where Aiden actually came to the dinner table with both bed hair and pyjamas. Let’s just say that it was one very chilled day, and I chose my battles. Luke turned 12 on the 20th July, the same day that school term began again, poor kid, he was not amused, but he loves school, so we celebrated on the Sunday before, and he took cupcakes to school for the class. We decided to keep it low-key, due to a valuable ninja lesson learned in June, and also next year would be a big celebration with Luke turning 13, so we agreed on some spending money, with which he bought a bow and arrow. Sigh. What was that about weapons of destruction? It’s pretty cool, though, and he’s loving it. Superheroes dress-up at Urban Edge Youth group. 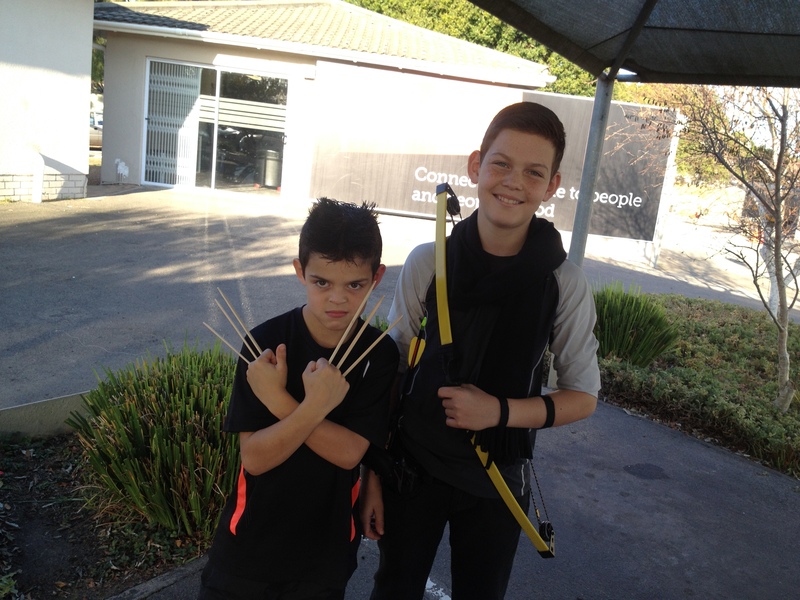 Ethan + 6 chopsticks + a snarl= Wolverine. Luke + bow and arrow= Hawkeye. We are surviving winter well, I think. I did decide on one day that cold and rain combined with laundry and dishes is misery. Then I decided I would not complain about it at all, and that does make a difference. Lack of whining = more contentment. Amazing, that! It’s nearly September and already we notice the days getting longer. We continue to relish the changeable weather here, and its unpredictability. My favourite thing on the morning school run- the dark line of the mountains in the distance against the sunrise. Changes every morning. Aiden and I had some quality time during a week where the younger boys went to Holiday Club at our church, and Joshua was a leader there. Whilst Aiden would be happy to chill out at home most days, and have several full pyjama days, I did drag him with me to see the CT Science Centre, and then I took him to feed the squirrels. 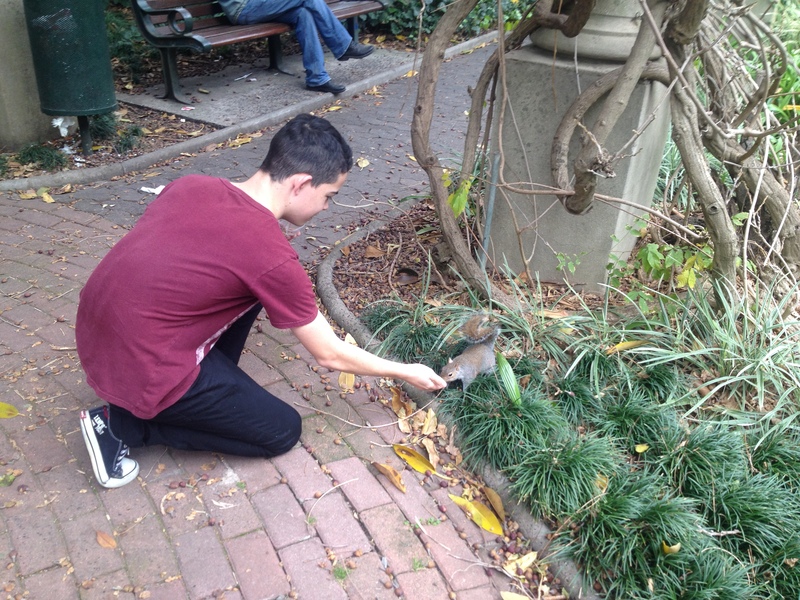 Squirrels are Aiden’s obsession. 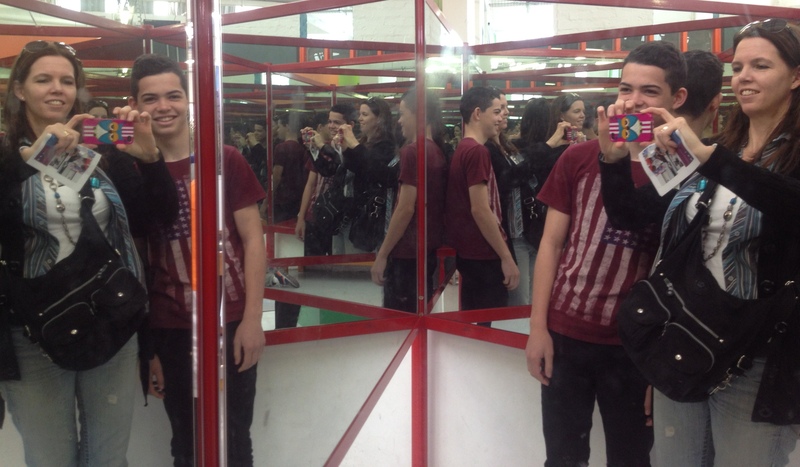 Human kaleidoscope- a bajillion Aiden and Me’s. How awesome! At the Company’s Gardens. The squirrels come and eat right out of your hands; pretty cool! Aiden wants a squirrel for a pet. He kept trying to plan how to smuggle one home. I have got a real sense of God in my life, more real than before, and at the most random moments, I am completely overwhelmed. I was hanging out one of Heath’s shirts to dry one day (I told you it was random) and was just struck with an emotion of thankfulness and gratitude for my husband, and my beautiful boys. Why didn’t I ever have moments like this before? (Granted, I wasn’t always hanging up the shirts.) Was it because I was ‘achieving grace’ with works, with every possible involvement in church and ministry; instead of living day to day, and giving God glory even in the mundane, finding His pleasure in the tiniest details? I think so. I’m getting there. 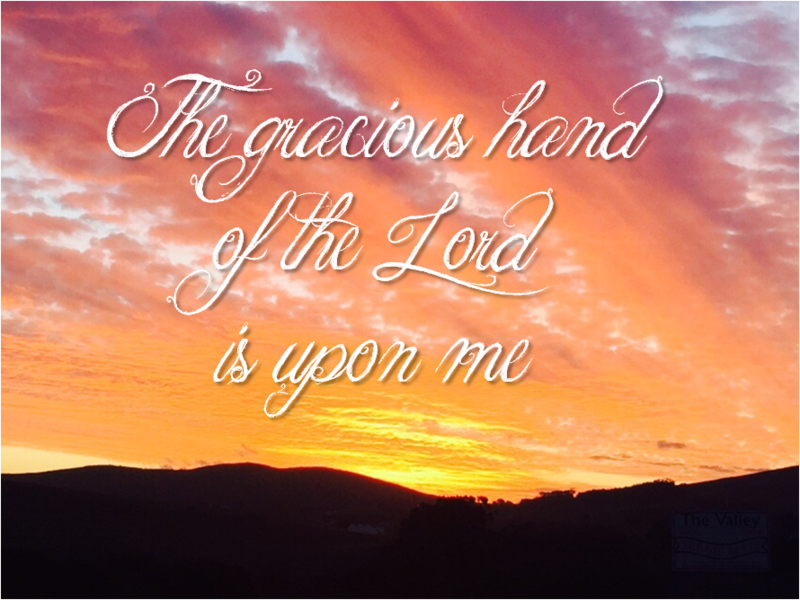 His gracious hand is upon me. A perfect moment. Next story Update 18. My oldest child turns 18. Shivers. 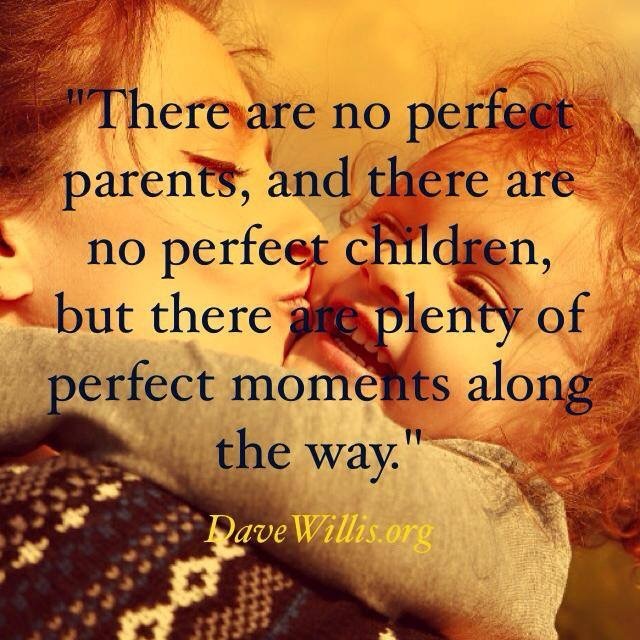 Love the perfect moment thing – we have a similar phrase, but for us it’s just “it was a Moment”. They come out of nowhere, take you totally by surprise by their impact, and leave you changed, enriched and with much more perspective. Also love that you’re learning how to live by grace and not works – wow, that’s one that took us years and years and years after leaving a certain place where we had works and performance drummed into us!?!? (Mentioning no names?!). It’s a spectacular journey with the Father, when we realise that, no matter if it’s a good day or a bad day, or if we’ve done good or bad, He still loves us just as much, and still walks with us step by step through our lives. You’re amazing, and you are creating a heritage for your family through these blogs – keep going, girl! I LOVE them. Love you too!